St. Mary's School of Medicine is in a transitioning process and will not be admitting a cohort class at this time. Do contact the St. Mary'sSchool of Medicine to inquire as to when the next cohort classes will begin. Students must have attained a minimum of ninety semester credit hours or a Bachelors degree (including completion of pre-requisites) from an accredited institution in order to be considered for admission directly into the 3½-year continuous Doctor of Medicine program (equivalent to 4 academic years). *** The student may substitute a semester of Biochemistry for a semester of Organic Chemistry. 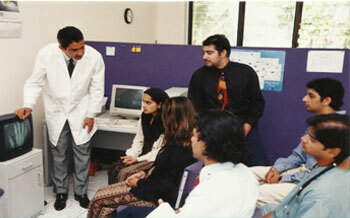 After successful completion of the Basic Science phase of the medical program, students enter the Clinical Sciences phase of their medical degree program. The Clinical Sciences component consists of 86 weeks of clinical rotations through various medical specialties in hospitals within the United States and abroad who have affiliated with St. Mary’s School of Medicine. During the Clinical Sciences part of the medical program, students will have 48 weeks of required core rotations in Surgery, Internal Medicine, Family Medicine, Pediatrics, Psychiatry, and Obstetrics and Gynecology. The remaining 24 weeks are elective clinical rotations and the student may choose which elective clinical rotations they wish to participate in. All candidates will be interviewed in person or by telephone before a final decision is made by the admissions committee with regards to the applicant’s acceptance. St. Mary’s School of Medicine does accept transfer students. The amount of transfer credit that will be accepted will be evaluated on an individual basis. Transfer credits completed from institutions listed with the Educational Commission for Foreign Medical Graduate and for coursework that a student has successfully passed will only be eligible for evaluation. No advanced standing or credit transfer for courses taken in Doctor of Chiropractic, Physician Assistant, Podiatry or Doctor of Dentistry degree programs will be awarded. Examinations will be given in each Basic science course, and each Clinical Science clerkship and elective throughout the trimester. Final exams are given at the end of each trimester and all the final examinations are comprehensive. The smaller examinations, quizzes, presentations etc. in a course will be at the discretion of the instructor. 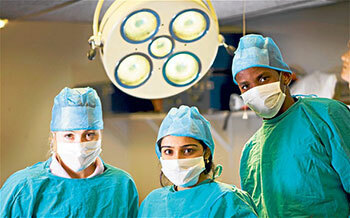 A score of 75% higher is required to pass examinations in the medical and nursing courses. Note: ST. MARY'S SCHOOL OF MEDICINE reserves the right to make any changes to the CURRICULUM indicated above at anytime. All changes will be applicable to all students.